Since Mumbai and Pune are in such close proximity to one another, a comparison between the two is inevitable. Though more and more of our favourite things (eateries, brands, etc.) are cropping up in Pune; here are 12 things that the ‘Maximum City’ has, which we’d love to see in Pune. No joke, Pune traffic has become as bad as Mumbai’s over the last few years. If we had local trains like Mumbai does – it’d surely help ease the road traffic, and also be a super convenient form of public transport within the city. The Bombay Canteen is a sizeable gem in Mumbai’s culinary crown – uniquely celebrating regional Indian food in a way, unlike any other restaurant. Though we’ve seen a lot of similar restaurants crop up in Pune, there isn’t one (yet) that can rival the food of The Bombay Canteen. Mehboob Studios in Bandra is a Bollywood icon; founded in 1954 by celebrated director-producer Mehboob Khan. In addition to being a recording studio, and film and television studio – some of the spaces here are also used for live music concerts (like the Mahindra Blues Festival), performing arts, and art gallery. A Bollywood celeb sighting here is always inevitable! No matter how many seafood restaurants we have here (and we do have quite a few), the catch is always that much fresher in Mumbai. Plump prawns, crispy ‘bangda’, and sweet crab plucked right out of the shell are just some of the oceanic treasures that you can literally buy fresh every day in Mumbai (shout-out to Sassoon Dock!). 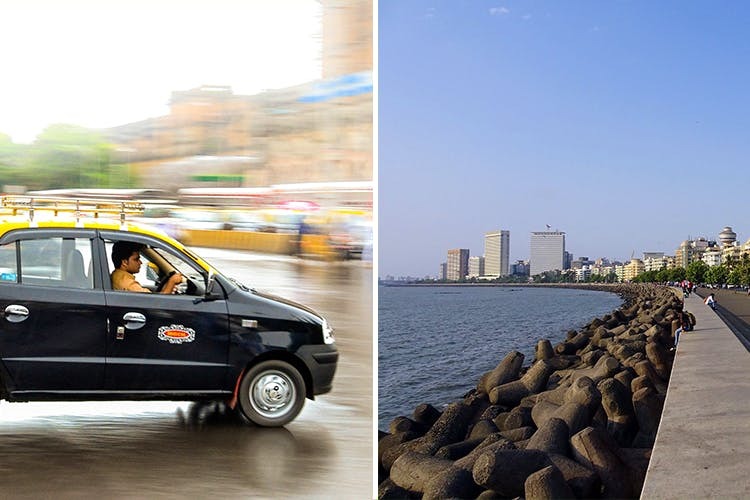 Mumbai’s famous kali-peeli (black-and-yellow) taxis are the OG cabs that we wish we had in Pune, too. Before Ola and Uber, and even now – these cabs are the preferred form of transport for Mumbaikars, popular for their old-school charm (can’t beat those Premier Padminis!) and kitschy-patterned interiors! Although we have plenty of venues that host stand-up comedy performances in Pune, we don’t yet have our own brick-and-mortar comedy clubs. Pune’s budding stand-up comedy scene is starting to thrive, and we could certainly use a Pune edition of Canvas Laugh Club or The Comedy Store – built exclusively for stand-up comics and a large audience. The Kala Ghoda Arts Festival is a week-long cultural festival that takes place in February each year. Showcasing architecture, food, literature, theatre, film, comedy, visual arts, music, dance, history, etc. in a very visual, interactive, and immersive way – this festival in the artsy Kala Ghoda/Fort district of South Mumbai brings together people from all corners of the city. Colaba Causeway is a treasure trove for the discerning shopper. From antiques to clothing, jewellery, electronics – you name it – they have actual stuff that you’d find on online websites or fancy boutiques, but for a fraction of the price. The variety and quality of things here – from the stalls to brick-and-mortar shops, are unlike anything we’ve found in Pune thus far. You don’t have to be a design student to appreciate the uniquely quirky Art Deco buildings that are spread throughout Mumbai. Sites like Marine Drive, Oval Maidan, Mohammad Ali Road, Bandra, Matunga, Chembur etc. have beautiful colonial-era structures that are in need of both preservation, and celebration! In fact, we hear that several organisations are formally petitioning for ‘Bombay Deco’ to be a UNESCO World Heritage Site. Though there are certainly Art Deco structures in Pune; most are privately owned (like bungalows) and not maintained in their original style. NCPA (National Centre for the Performing Arts) was inaugurated in 1969, and was the “first multi-venue, multi-genre cultural centre in South Asia”. Currently touted as ‘India’s premier cultural institution’, the NCPA is a hub for celebrating art, theatre, music, dance, literature, film, photography, and local talent. From travelling ballet troupes, to ‘experimental theatre’, orchestras, film festivals, and much more – we really wish we had such a celebrated cultural space like this in Pune. Most of Mumbai’s old industrial mills have been re-purposed and re-developed into offices and business districts, but have also become a hub for restaurants and performance venues. For example, Kamala Mills, Todi Mills, Richardson & Crudas, etc. Yeah, we know it’s never going to happen – but we can’t help but fantasize about what it would be like if Pune had its own churning water body that offered fresh seafood, boat rides, gorgeous sunsets, and that hard-to-bottle ocean spray smell.